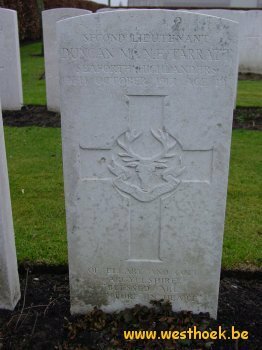 Second Lieutenant DUNCAN MCNEILL FOX TARRATT 2nd Bn., Seaforth Highlanders who died on Thursday 4 October 1917. Age 19. Second Lieutenant DUNCAN MCNEILL FOX TARRATT 2nd Bn., Seaforth Highlanders who died on Thursday 4 October 1917. Age 19. Younger son of Joseph Fox Tarratt, of Ellary, Ardrishaig, Argyll, and of Mary Georgiana Helen McNeill, his wife. Laird of Ellary, Ardrishaig, and the Isle of Coll, Argyll. His elder brother also fell. CEMENT HOUSE CEMETERY Grave XIII. A. 3.